As a relative to the other tapestry The Flemish countryside, The Flemish village is a tapestry typical of the verdure tapestries from the 17th century. These evocative scenes of the Belgian countryside also known as Paysage Flamand Village shows the life of villagers in a time and place where the virtues of balance with nature, romanticism and living among natural beauty are admired. This scene features villagers on the river side fishing near a moored boat with the manor further in the background. The luscious style of the foliage is typical of the verdure tapestry from the Oudernaarde region. 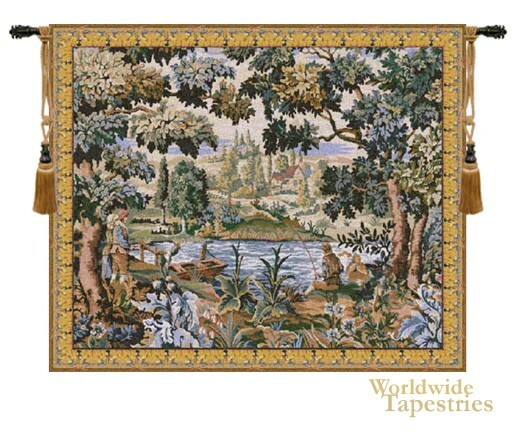 The Flemish village tapestry is backed with lining and tunnel for easy hanging. Note: Tapestry rods and tassels, where pictured, are not included in the price. Dimensions: W 45" x H 38"